Specializing in combination attacks, this warrior uses magnetism to block an enemy's escape. Specializing in combination attacks, this warrior is equipped with a tough, magnetically coated armor. Cannot be Normal Summoned/Set. Must be Special Summoned (from your hand) by sending 1 LIGHT Dragon-Type monster and 1 LIGHT Fairy-Type monster you control to the Graveyard, and cannot be Special Summoned by other ways. Once per turn: You can declare 3 card names; excavate the top 3 cards of your Deck, add any of them that you named to your hand, also send the remaining cards to the Graveyard. This card's ATK and DEF each become equal to the number of cards added to your hand by this effect × 1000. Once per turn, when a Machine monster is destroyed by battle and sent to your GY: You can Special Summon 1 Machine monster from your Deck that has the same Attribute and less ATK than that destroyed monster in the GY. FLIP: Add 1 "Commander Covington" from your Deck to your hand. Cannot be Normal Summoned/Set. Must be Special Summoned by "Commander Covington", and cannot be Special Summoned by other ways. You must pay 1000 Life Points to declare an attack with this card. You can send this face-up card you control to the Graveyard to target 1 "Machina Soldier", "Machina Sniper", and "Machina Defender" in your Graveyard; Special Summon those targets. 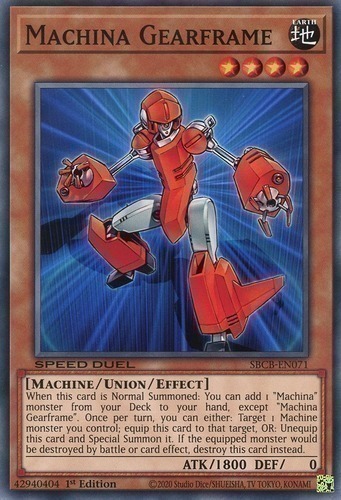 You can Tribute this card; Special Summon 1 "Machina" monster from your hand or Deck, except "Machina Megaform". If a face-up "Machina Fortress" you control is sent to the Graveyard, while this card is in your Graveyard (except during the Damage Step): You can banish that "Machina Fortress" from the Graveyard; Special Summon this card. You can only use 1 "Machina Megaform" effect per turn, and only once that turn. "Machina" monsters cannot be attacked, except "Machina Sniper". When this card is Normal Summoned while you control no other monsters: You can Special Summon 1 "Machina" monster from your hand, except "Machina Soldier". This card can be used to Ritual Summon any "Cyber Angel" Ritual Monster. You must also Tribute monsters from your hand or field and/or shuffle Fairy or Warrior-Type monsters from your Graveyard into the Deck, whose total Levels exactly equal the Level of the Ritual Monster you Ritual Summon. This card can be used to Ritual Summon any "Cyber Angel" Ritual Monster. You must also Tribute monsters from your hand or field whose total Levels equal or exceed the Level of the Ritual Monster you Ritual Summon. If a LIGHT monster(s) you control would be destroyed by battle or card effect while this card is in your GY, you can banish this card instead. All Machine-Type monsters on the field gain 200 ATK. Each time a face-up Machine-Type monster(s) on the field is destroyed by battle or card effect, place 2 Junk Counters on this card. You can send this card to the Graveyard, then target 1 Machine-Type monster in your Graveyard whose Level is less than or equal to the number of Junk Counters that were on this card; Special Summon that target. A Machine-Type monster equipped with this card increases its ATK and DEF by 300 points. Target 1 Machine monster you control with 500 or less ATK; Special Summon up to 2 monsters from your Deck with the same name as that face-up monster. This card gains 100 ATK for each Machine-Type monster on the field. Special Summon this card as an Effect Monster (Machine-Type/EARTH/Level 4/ATK 1000/DEF 1000). (This card is also still a Trap Card.) You cannot Normal or Special Summon other monsters the turn you activate this card. Once per turn, during your Main Phase: You can Tribute 1 Machine-Type monster; this card gains ATK equal to the ATK the Tributed monster had on the field, until the end of this turn. This card gains 100 ATK and DEF for each Machine-Type monster on the field, except this card. 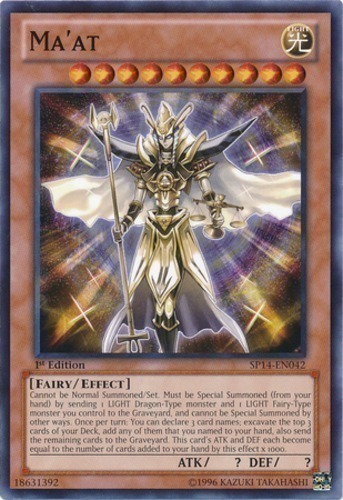 When this card resolves: You can Special Summon 1 "Helios - The Primordial Sun" from your hand or Deck. While this card is face-up on the field, any card sent to the Graveyard is banished instead. If this card attacks a Defense Position monster, inflict piercing battle damage to your opponent. If this face-up Attack Position card is targeted for an attack: Change it to Defense Position. He used to be a normal dog who played around in a park, but was corrupted by the powers of darkness.